Combination Wilderness lodges, hotel and fully serviced Discoverer camping in private concession areas. TAILOR-MADE ITINERARY OPTIONS ARE ALSO AVAILABLE ON FLEXIBLE DATES, FOR GROUPS OF UP TO EIGHT GUESTS. Namibia is a land of stunning landscapes, endless skies, barren deserts, rugged mountains and spectacular wildlife - and the Great Namibian Journey encompasses it all. This cross-section explores the dunes of Sossusvlei and the Namib Desert, the stark beauty of the Skeleton Coast, amazing marine life just off Swakopmund, the volcanic rock-strewn landscape of Damaraland and the game-filled savannah of Etosha. The activities provide a wide range of differing impressions, from scenic flights up the Skeleton Coast, dolphin cruises with private beach lunch, to hiking and cycling in Damaraland, walking in the Namib's great dunes and interacting with traditional Himba people. This safari combines the exclusive luxurious lodges of Wilderness Safaris with the remote locations of private Discoverer campsites, in unique Meru-style tents. The style of accommodation in the private Discoverer campsites takes you back to the era of Africa's exploration. Pure linens of heavy cottons, brass bucket showers and basins, separate flushing toilets and shower areas all add to the atmosphere, while comforts and amenities are elegantly provided. Discoverer camping aims to bring the guest closer to nature, by means of a lively campfire, hurricane lanterns, wide-ranging activities and a warm atmosphere complimenting the comfort and added luxury of the lodges visited. Discoverer camps are specifically outfitted to ensure that old-style camping feel with a clear emphasis on necessary and stylish comfortable interiors, creating a peerless wilderness experience. The entire safari is guided and hosted by a professional trained guide with in-depth knowledge and experienced knowledge that creates an unsurpassed seamless safari experience. Most areas in which we travel are private concessions, with Discoverer campsites being for the sole use of Discoverer Safari guests. 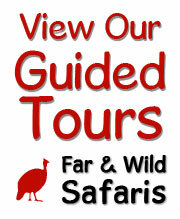 At the lodges and hotels en route we have the chance to meet other Wilderness Safaris guests. To maximise guests' travel time, a variety of travel modes that bring out the best of each area is used: flying in private charters and overland transfers provide both a bird's-eye view and an in-depth experience of the contrasting landscapes of Namibia. Days 1 & 2: From Windhoek drive to Kulala Wilderness Camp, Sossusvlei. Days 3 & 4: Drive to Hansa Hotel, Swakopmund. Days 5: Drive to Damaraland Camp, Damaraland. Days 6 & 7: Drive to Palmwag Rhino Camp, Damaraland. Days 8 & 9: Drive to Ongava Tented Camp, Etosha. Days 10, 11 & 12: Fly to Skeleton Coast Research Camp, Skeleton Coast National Park. Day 13: Fly to Windhoek. Kulala Wilderness Camp lies at the foot of a mountain facing west to catch the majestic Namibian sunsets. It comprises 9 tents on elevated wooden decks which are linked to the main dining room, bar, reception area and swimming pool by pathways. The interiors are simple yet stylish and each tent has 220V lighting and an en-suite bathroom with solar-heated water. There is a fully stocked bar and traditional 3-course dinners are served. At night, lanterns light up the main area. On the edge of the oldest desert in the world, wildlife here is sparse but fascinating. Sightings of animals such as springbok, gemsbok, ostrich, bat-eared fox and aardwolf are exciting in these rugged conditions. On our second day we explore the ice-blue Atlantic coast, from the port towns of Walvis Bay and Swakopmund to its incredible marine mammals. A private boat cruise at Walvis Bay and down the coast to Sandwich Harbour (weather permitting) provides a unique chance to see the diverse pelagic (ocean-going) birdlife, Cape fur seals and rare Heaviside's dolphins up close. This activity is rounded off with a private seafood lunch, before returning to the hotel in the afternoon. The remainder of the afternoon is at leisure to explore the charming town of Swakopmund before meeting in the evening for dinner. Damaraland Camp accommodates guests in 10 comfortable tented rooms, with en-suite facilities including flush toilets and showers with hot and cold running water. (Laundry facilities are limited due to the low rainfall in the area). The dining room and pub are combined under canvas, and an open fire is enjoyed on calm evenings. A lovely feature of the camp is its unique rock pool. Palmwag Rhino Camp is situated in the enormous private Palmwag Reserve in north-west Namibia, between Etosha and the Skeleton Coast - few places on the planet can offer this level of privacy and wilderness experience. Palmwag Rhino Camp accommodates guests in 7 large East African-style Meru tents, each with an en-suite bathroom and a classic bucket shower that is filled with hot water whenever needed. Lights are powered by solar panels and the tented dining room offers uninterrupted views of the desert and mountains. On the second day, the highlight is rhino tracking on foot or by vehicle; other activities include day and night nature drives. Ongava Tented Camp comprises 10 large comfortable walk-in tents, each with en-suite facilities, including flush toilet and a hot shower. All meals are enjoyed in the thatched dining area that overlooks an active waterhole. There is a small pool in which to cool off as well. Skeleton Coast Research Camp comprises 5 Meru-style tents nestled between granite rocks. Surrounded by pure wilderness, this camp is truly remote and the perfect setting for a serviced style of camping. The camp is outfitted with necessary comforts and equipment, essential elements to the old and relaxed manner of early explorers. International air connection onto the safari: If arrival is planned for the day of the safari's departure, please ensure that this is with the earliest possible international flight arrival, before 10h00. Arrival on a later flight may necessitate additional road or air transfers (as the main group's departure for the first camp/lodge will already have taken place), subject to extra cost. International air connections leaving the safari: Please ensure that your departure flight is booked for after 15h30 from Windhoek. For earlier international departure flights, an additional transfer will be required to arrive for this connection, subject to extra cost. Camera battery charging facilities: Please note that a 12V cigarette lighter adaptor will be required (that is compatible with camera make) on this safari for charging batteries while on game drive or transfer drives. 110/ 240V outlets are available at the permanent lodges; however Skeleton Coast Research Camp only has 12V electricity.